Some parents find it difficult to express love for their children in outward displays affection. They assume their children know they love them even when they do not say it in words. These parents reason that the children see how hard they work to feed, clothe and educate them. They assume their children understand that these sacrifices are made because they are loved. Parents may not see the need to put their feelings into words like "I love you very much and care about you," or to give a big hug and kiss when they see the children. It is unwise to assume that children are secure in the knowledge that you love them. Parents who make such assumptions are in danger of being totally overwhelmed when in later years their child says, "I never knew how much you cared. You never told me. All of those years growing up, I felt you did not love me." Or, even worse, "I never felt loved." Children need to experience affection directly. They cannot guess at your motives - that is too abstract a concept. Expressing love to children in words, hugs and kisses is difficult for some people not only because of their temperaments but also because they were brought up without these things. They have no model for outward expressions of love and do not know where to begin. You can begin by saying encouraging words to your children when you interact with them. Make a conscious effort to communicate something positive: "You look nice this morning, Jane. That's a good color for you," or "We really enjoyed being with you today." 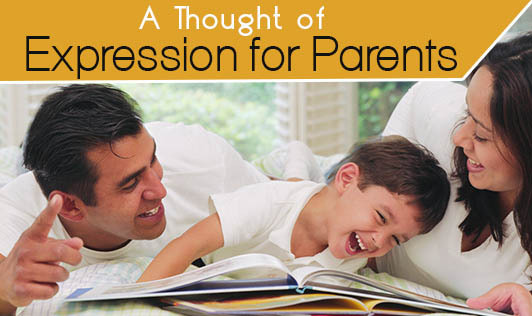 This is particularly valuable when parents and child have engaged in some pleasant activity. Let your children know that you are aware of them and concerned about how they feel. If you do not give hugs easily, you might begin by just putting your hand on your child's shoulder or gently rubbing his back. Some people are afraid of rejection and hold back. Try to overcome this feeling and work up to little and then bigger hugs. Children might initially say "ugh" and hold back, but most like it and will come to look forward to a show of affection from family members. Eventually, you may be able to add words like "I love you very much" or "You're a great kid, and I'm glad I'm your dad [or mum] to the hug. Another way to work up to spoken words is to begin with writing. Some parents put notes in their children's lunch boxes that express affection or encouragement. When your child goes away to camp or visits a relative, write notes telling her how much she is loved. Another opportunity not to be missed is when children go away to college. You can send hugs by mail. There are wonderful cards that express emotions you may not be able to. Every time you go by a card store, look around; you'll find cards that express how you feel. Send the cards often for no particular occasion. Your children will get the message of love. You do not need to wait until Valentine's Day to show your children affection. That comes around only once a year.